The EQT Ten Miler was held on November 10, 2014. This was the second year for the 10 Miler and also the second time I have ran it. I set a goal to run the race faster than I did last year. Since I used this race last year as a training run for the Las Vegas Rock and Roll Half Marathon, I figured that goal would be achievable. Mile 1: The race begins. Since I arrived late I barely had time to tie my shoes properly. My race bib is not straight and my right shoe feels like it's too tight. Oh well, here it goes. I check my watch after the first mile. It's under ten minutes. I typically hold back early on in a race. But the heck with that. I'm tired of always holding back. Mile 2: We head into our first neighborhood, West End, which is fun, but also includes a pesky little hill. It's not long, but it's very step and takes some effort to climb. I continue running towards the West End Bridge and I feel like everyone is passing me! I can't figure it out because I'm in the group for 10 minute miles and that's what I'm running. I tell myself it's OK. On the West End Bridge I turn to look at the city skyline in the morning sun. This view will never get old. Mile 3: After crossing the bridge we head away from the city towards the North Side. It's not the most scenic route but it cuts down the mileage in the Strip District (which was part of last years race) so I'm all for it. Mile 4: We have a long uphill climb but I'm not slowing down much. In fact, I'm passing a lot of people. I feel relieved and out of breath when I reach the top. That will be the worst hill of the race. Miles 5-6: We run through a park and I'm surprised by how fast I am still running. I'm almost halfway and my confidence is building. I'm hopeful I can hold onto this pace. 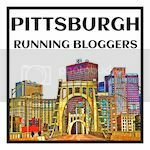 The next part of the course includes a short trip to downtown via Roberto Clemente bridge and then back to the North Side on the Andy Warhol Bridge. This downtown block is a high energy area where many spectators gather. When I reach downtown there's a large crowd cheering. I know they are there for others but I feel like they are there for me. The combination of my fast pace, the cheering of the crowd and the ability to run the streets of a city that I so dearly love overwhelm me. I start crying. I'm glad I'm wearing sunglasses. I can hear the crowd cheering behind me as I cross the Warhol Bridge. After coming back to the North Side we run down an alley and then up a ramp, I think. "What is this? A ramp? A sidewalk?" I wondered to myself. Whatever it is I feel strange running it and just want it to over as soon as possible. At the fluid station after Mile 6 I take my gel. The last bridge and the Strip District is coming up. Mile 7: I cross the last bridge and into the Strip. As I approach mile 7 I feel good, but I'm starting to hurt. My feet, my shins and my knees all feel pain but it's nothing to the pain I felt just a few weeks ago. Screw you pain and suffering! Screw you heartbreak! Mile 8: As I get closer to Mile 8 I know I have a lot left in the tank. I decide that I'm going to push as hard as I can for the last two miles. Mile 9: After hitting the 8 mile mark the rest of the race is mostly a straight away back to downtown. I turn up the speed to 9 min/mile. I look down and see the mile marker for this years past marathon: 24. It dawns on me that I was just here in May running 26.2 miles. I've only ran 8 today. This race has got nothing on me! Mile 10: I'm keeping my speed but it's challenging. I just hope I can hold on. We make a right on to Liberty Avenue. I see the finish. I look at my watch and I have a chance to finish under 1 hour and forty minutes. I need to go for it. I pump my arms and legs as fast as I can. I feel woobly and unsteady. I'm not sure what's going to give out first: my legs or my stomach. I hold it all together and cross the finish. My official time is 1:39:47. When I crossed the finish, I walked around in disbelief. Just seven weeks after suffering a miscarriage, which was a terribly tramatic experience, I had just ran the fatest ten miles I've ever ran in my life. I had beat my previous time by over seven minutes. But the numbers were only part of this story. During this race I felt so many emotions I hadn't felt in a while. I was excited and eager at the start line. I cried tears of happiness when I heard the cheers of supporters. I got goosebumps when I saw the finish. But most of all, when I crossed the finish I finally felt proud of myself again. I felt accomplished. No longer was I just getting by, but I was living life on my terms again.